Being the dependable, strong, reliable, and predictable one all the time will only get YOU depended upon, recognized as, expected to, and assumed to be, all the time. Not every moment will work/work out in YOUR favor and YOU have a right and reasons to be vulnerable sometimes. 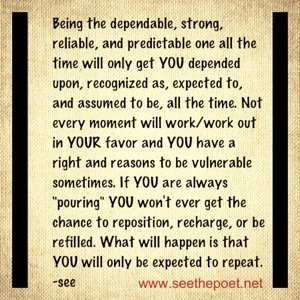 If YOU are always “pouring” YOU won’t ever get the chance to reposition, recharge, or be refilled. What will happen is that YOU will only be expected to repeat. This entry was posted in Uncategorized and tagged Drive, Hope, Inspiration, Motivation, Perspective, seethepoet, Truth on July 22, 2013 by seethepoet.